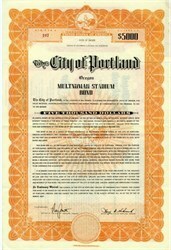 Beautifully engraved Multnomah Stadium $5000 Bond Certificate from the City of Portland issued in 1957. This historic document was printed by the Irwin Hodson Company and has an ornate border around . This item has the printed signatures of the Mayor and Auditor. Providence Park (formerly Jeld-Wen Field; PGE Park; Civic Stadium; originally Multnomah Stadium; and from 1893 until the stadium was built, Multnomah Field) is an outdoor sports venue in the northwest United States, located in the Goose Hollow neighborhood of Portland, Oregon. The MLS Portland Timbers and NWSL Portland Thorns FC soccer teams use the facility as their home pitch, as do the PDL's Timbers U23s. The NCAA Division I FCS Portland State Vikings football team uses the park during the Big Sky season. The stadium has been host to several major sporting events including Soccer Bowl '77, the 1999 and 2003 FIFA Women's World Cups, the 2009 Triple-A All-Star Game, the 2013 CONCACAF Gold Cup, the 2014 MLS All-Star Game and the 2015 NWSL Championship Game. The stadium capacity will be expanded with 4,000 new seats within the next years. Originally, the park was owned by the Multnomah Athletic Club and used by their amateur sports teams. In the 1950s, the PCL Portland Beavers baseball team moved out of Vaughn Street Park into what was then known as "Multnomah Stadium." In 1966, the city purchased the stadium and renamed it "Civic Stadium." It was renovated in 2001 to accommodate the Beavers, who had not played at the park since the early 1990s. The naming rights of the stadium were purchased by Portland General Electric and it was renamed "PGE Park." In 2010, the park underwent renovations again, this time so it could accommodate the Portland Timbers MLS franchise and a year later the rights to the stadiums name were sold, this time to Jeld-Wen. In 2014, the name was changed again to "Providence Park" after Providence Health & Services bought the naming rights.The stadium sits on a rectangular block bounded by Southwest Morrison Street, Southwest 18th Avenue, the Multnomah Athletic Club building and Southwest Salmon Street, and Southwest 20th Avenue.